As you can see (scroll down ya lazy bum) B and I tried out a New Orleans themed restaurant this weekend. One of the things that stood out to me on the menu was their Shrimp and Grits. Unfortunately, it was made with bacon, and ham, and all sorts of things that most people find delicious that I don’t eat. So I sighed and (tragically) opted for the catfish (can you feel the sarcasm?). I was inspired though. I wanted to make Shrimp and Grits at home. I have never been a huge fan of grits. My dad is from the south and has them as a side with his eggs and I was always like “eh, I’d rather have home fries with ketchup and hot sauce” also known as the NJ diner way of eating egg sides. 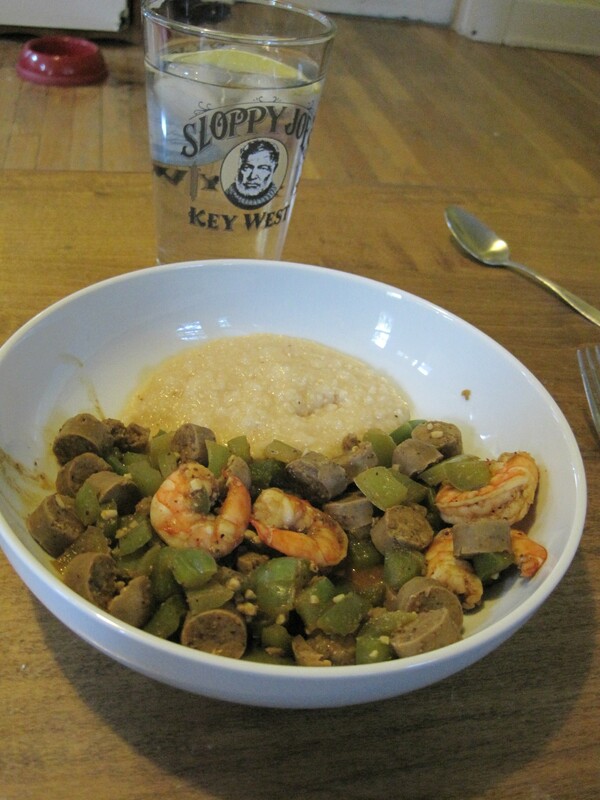 Thumbing through a cookbook in our kitchen I found a recipe for shrimp and grits that I wanted to try to work with. First, the grits had cheese in the recipe. I thought, “Self, you love cheese. This can’t be bad.” Also, this recipe seemed to be incredibly Weight Watchers friendly (which it turned out it was). I made a few adjustments to the recipe that can be changed back. First, I swapped out 6.5 oz of Turkey sausage for one box of Morningstar Farms Sausage links (10 links). Second, I added a lot more Old Bay Seasoning. In the future, I think I would dramatically reduce that quantity and increase the amount of hot sauce in the shrimp mix (which the recipe did not originally call for. I liked the strong Old Bay taste but B seemed a little lukewarm on it. For mass appeal I would reduce to 2 tsp from 4 1/2 tsp. A final benefit of this meal, it was incredibly quick to make. With prep time for chopping it took no more than twenty minutes to make the entire dish. Enjoy! 1) Heat a large non-stick pan or skillet over medium-high heat. Coat pan with cooking spray. Add shrimp, 3 tsp of seasoning, cayenne, salt, and pepper. Toss to coat. Cook approximately 3 minutes or until the shrimp are done, stirring frequently. Remove shrimp from pan and keep warm. 2) Return pan to medium-high heat. Coat pan with cooking spray. Add bell pepper. Cook for approximately 2 minutes, stirring frequently. Add sausage, remaining seasoning, and hot sauce. Cook approximately 2 minutes or until lightly browned, stirring frequently. Add reserved shrimp and garlic. Cook 1 minute, stirring constantly. Add 1/4 cup of water. Cook for about 30 seconds scraping pan to loosen browned bits. Remove from heat and let stand for about 2 minutes. 1) Bring 1 1/2 C of water to a boil in a medium saucepan. Gradually stir in grits to boiling water. Cover and reduce heat to low. Simmer for about 5 minutes. Stir in milk. Remove from heat and stir in remaining ingredients. Serve shrimp over the grits. And serve warm!